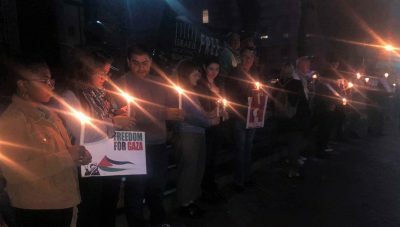 the first known Israeli ground incursion into Gaza since Operation Protective Edge, in July 2014, set off a seven-week war. 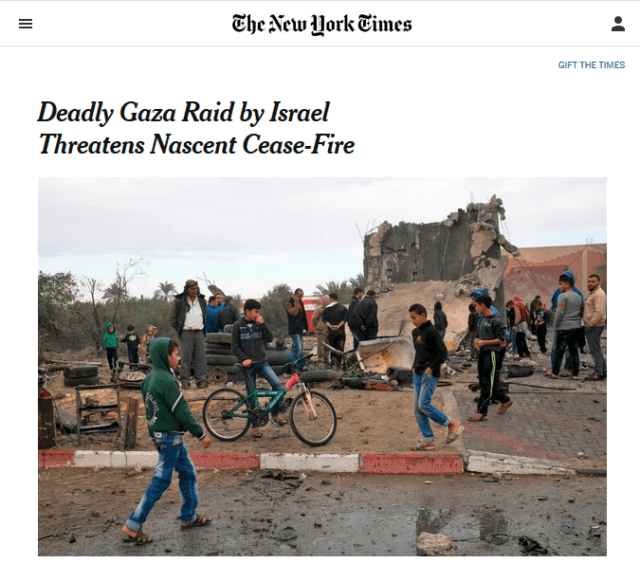 A New York Times article (11/11/18) misstates the number of recent Israeli ground incursions into Gaza by two orders of magnitude. Israel carried out 21 incursions into Gaza in 2014…. The next year, in 2015, that number more than doubled, to 56 incidents. In 2016 and 2017, 68 and 65 incursions took place, respectively. By end of October 2018, 73 such incidents had been recorded, according to the UN data. 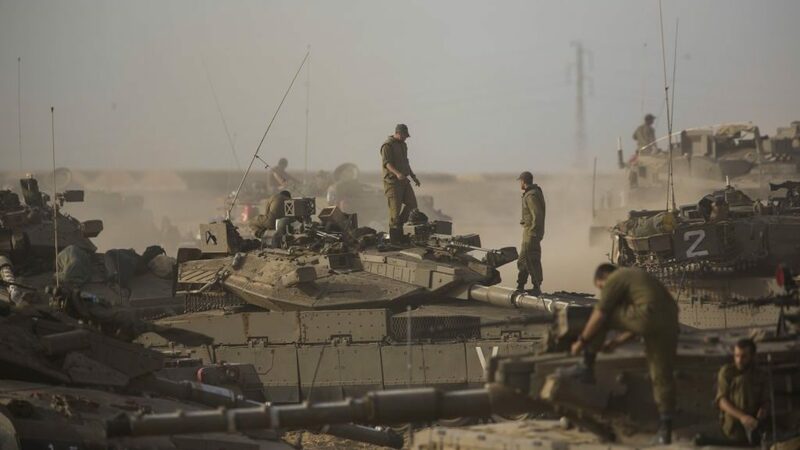 Please tell the New York Times to issue a correction on the frequency of IDF ground incursions into Gaza. If you wish, leave copies of your communication in our comments below. Please remember that respectful communication is the most effective. This article originally appeared on fair.org. Over the past six months however, trouble seems to have emerged in paradise, especially evident within Israeli defense, intelligence and diplomatic circles, where people examine Trump’s conduct from up close on a daily basis, try (to no avail) to understand his modus operandi and policies, and who are extremely worried about things to come. President Donald Trump will mark two years in the White House this month, a milestone that by appearances has been a dream come true for Prime Minister Benjamin Netanyahu. Netanyahu spent 11 years in office with Democratic US presidents Bill Clinton and Barack Obama, who — to put it mildly — did not appreciate or believe him and waged a constant war of attrition against him over the settlements he approved in the West Bank. Finally, there is a Republican on the scene — and what a Republican! Netanyahu and the entire Israeli political right welcomed Trump ecstatically. But did their expectations pan out? Over the past six months however, trouble seems to have emerged in paradise. If one sets aside the settlers and the impressive control wielded by Ambassador Ron Dermer over Trump’s circle and Netanyahu himself — who calls Trump “my friend” at every opportunity — one finds other views, too. These are especially evident within Israeli defense, intelligence and diplomatic circles, where people examine Trump’s conduct from up close on a daily basis, try (to no avail) to understand his modus operandi and policies, and who are extremely worried about things to come. Israel is not at ease and finds it hard to accept the US withdrawal from Syria. From a military standpoint, the American presence is marginal. In terms of diplomacy and psychology, it holds tremendous importance. The very US presence curtailed Russia’s influence in Syria and imbued the pro-American players — including Israelis, Kurds and others — in the arena with self-confidence and provided them with tail winds. It also greatly benefitted Israel’s ongoing military activity in the Syrian arena against Iran’s entrenchment there. Netanyahu has in recent days exerted pressure on the White House, and he now claims he had elicited a promise from the president of a gradual rather than an immediate withdrawal from Syria. Some in Netanyahu’s circle believe Israel should apply more aggressive pressure, including the mobilization of the president’s evangelical political base, to reverse Trump’s decision. But Netanyahu hesitates. Despite his friendship with Trump, no one ever knows where Trump has drawn his red lines and when they will be crossed, turning the president into an anti-Israel troll — as has been the case with quite a few US allies over the past two years. ← Who Is Right on America’s Enemies?